Posted April 11, 2019 by Andrew Dexter & filed under Headlines, News. The picture, which has been discovered on the official Star Trek website, shows Peck’s Spock in a proper Starfleet uniform with a clean-shaven mug. 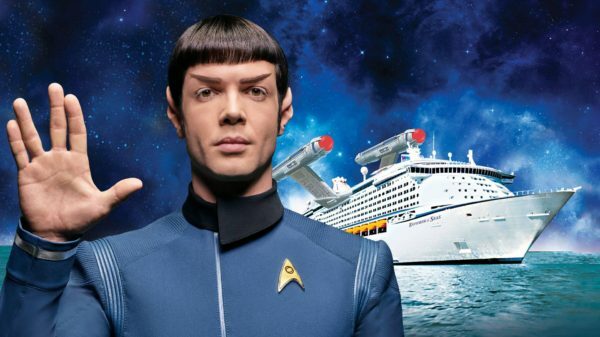 It seems to be a promo image for Star Trek: The Cruise, a real-life promo event where viewers can sail the seas with stars from the Trek TV shows and films. If you were ever in doubt that Peck looks the part to play Spock, here’s your proof that he’s very much got the physical traits to step into Leonard Nimoy and Zachary Quinto’s iconic role. With the beard gone and Peck’s hair trimmed into Spock’s trademarked bowl cut, Peck is a dead-ringer for the classic version of the character. Look, he’s even doing a Vulcan salute! What a pro. It’ll be interesting to see when this clean-shaven version of the character pops up in Star Trek: Discovery itself.